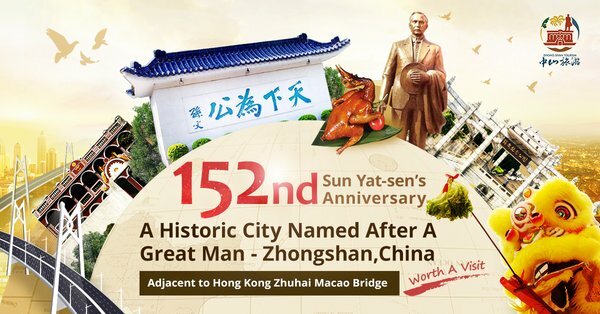 November 12, 2018, wasthe 152nd anniversary of the birth of Sun Yat-sen, the pioneer of the famous revolutionary movement of the Chinese nation. On this day, people remembered his contribution to national independence and social progress. At the same time, China’s city of Zhongshan, named after him, also entered people’s minds with its rich folk culture and famous historical charms, attracting the attention of people from all over the world. Visitors to China’s city of Zhongshan will find a region of rich culture, heritage sites and Silk Road exploration. On the west bank of the Pearl River, Zhongshan has a long history of more than 860 years that today blends traditional folk customs with modernity. Intersecting with Hong Kong and Shenzen to the east, Zhuhai in the south, Guangzhou in the north, and located in the centre of Guangdong-Hong Kong-Macau Greater Bay Area, Zhongshan is only one hour’s drive away from each city and has an advantageous geographical location. Within 90 km of this area are five airports at Hong Kong, Macau, Guangzhou, Shenzhen and Zhuhai. Moreover, Zhongshan is a livable city and outstanding tourist city with endless entertainment, historical charms and an unforgettable memory. The folk customs of Zhongshan are popular among tourists. There are traditional Xiaolan chrysanthemums, floating parades, Changzhou drunk dragons, dragon boat culture and so on. From November to December, visitors can head to Xiaolan Town to visit the famous chrysanthemum exhibition. The blooming chrysanthemums form a burst of full golden flowers and fragrance. Visitors can try exotic foods such as chrysanthemum meat, chrysanthemum fish balls and even chrysanthemum wine. Exquisite clothes, lion dances, unicorns and golden dragons constitute a colorful parade. The floating parade runs through the village lanes and cruises through the lush green fields. The scene is amazing. Each year on 5 May (Chinese Lunar calendar), visitors can watch the cultural dragon boat race festival in Zhongshan, Shiqi Town, which has a rich history of dragon boat racing. On May 5th, a series of ceremonies are conducted to celebrate the festival. The dragon boats compete intensely along Qijiang River to the beating of gongs and drums. Shiqi Pigeon, Dongsheng Crisped Grass Carp, Shaxi Braised Pork, Huangpu Cured Meat, Sanxiang Rice Flour Noodle, Xiaolan Chrysanthemum Feast, Xiaolan Fish Ball and Almond Cake. Along with winning the “National Forest City” award this year, Zhongshan also has a wealth of tourism resources for any type of traveler. It is the only national key cultural relics protection and the national 5A level tourist attraction unit in Zhongshan City. Located in Cuiheng Village, Zhongshan City, it is surrounded by mountains and Zhujiang River, near the Hong Kong-Zhuhai-Macao Bridge. It is mainly composed of the former residence of Sun Yat-sen and the Sun Yat-sen Cultural Relics Museum. The former residence of Sun Yat-sen covers an area of 500 square meters, with a construction area of 340 square meters and a display area of 1,100 square meters. A popular stop is the Sun Yat-sen Park in the southern part of downtown Zhongshan. Spanning an area of 26.6 hectares, the park was opened in 1996 to honour the birthday of Sun Yat-sen. A bronze statue of Sun Yat-sen stands proud, while there is also a fountain, pine garden, bamboo garden, plum garden and 999 dragon cypress hills for visitors to peruse. The garden building is based on the Suzhou-Hangzhou gardens and integrates the essence of Chinese classical gardens to form the architectural style of heaven and man. With advanced water recreation equipment, tourists can truly experience the thrill of fighting the waves. A night tour of the Qijiang River is a much loved activity by local Zhongshan people. Visitors can also take part in the six kilometer journey in cruise vessels along the Qijiang River, admiring the beautiful trees and flowers that dot the landscape of Zhongshan. 10 unique boutique tourism routes, including the human history tour, world heritage tour, study tour exchange, sea silk exploration tour, science and technology innovation tour, yacht free travel, beautiful country tour, health and wellness tour, leisure food tour, and so on.